Without getting too much into the technical jargon behind MP4, let’s just say that the format was developed by the International Organization for Standardization (ISO) so people can agree on something that works. 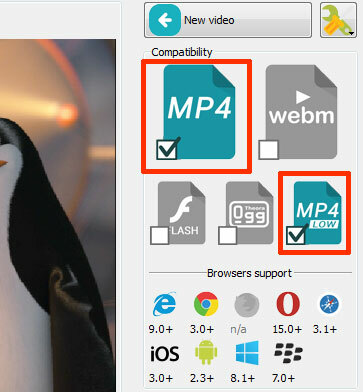 Like other streaming mediums, MP4 is a modern container format that allows content creators to distribute free and paid content over the internet. MP4 offers excellent compression for greater quality videos, and is the preferred format for many services and gadget makers such as Apple. Until this day, Apple’s iOS platform still doesn’t support flash, and as a developer it’s a given that they need a media medium that works on things such as iPads and iPhones. In essence, if content creators and developers are utilizing MP4 to distribute content, then they’re just biting themselves in the foot. Most people who buy gadgets from Apple are content consumers, and they could care less about the format and more so about whether or not it works with a flick of a finger. Luckily for developers and content creators, creating MP4 files for distribution on the World Wide Web isn’t hard. There’s a free software by the name of EasyHTML5Video that will do all the work in just three steps. Just drag-n-drop the file, tune the settings and publish. It’s that easy.